Actress, New Media Geek, Gamer, Misanthrope. Voracious reader of Fantasy and Sci-Fi, especially with a romance twist. Has a book club on Goodreads called Vaginal Fantasy Book Club to celebrate the smuttier side of genre literature. Felicia is the creator of The Guild and producer of the web series network Geek and Sundry. 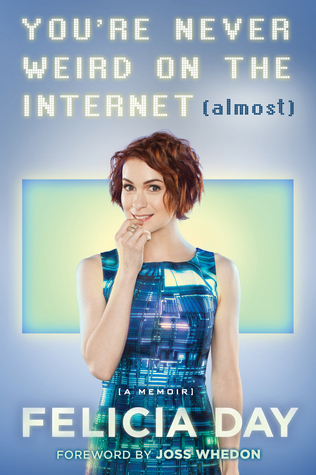 From online entertainment mogul, actress, and “queen of the geeks” Felicia Day, a funny, quirky, and inspiring memoir about her unusual upbringing, her rise to Internet-stardom, and embracing her individuality to find success in Hollywood. The Internet isn’t all cat videos. There’s also Felicia Day—violinist, filmmaker, Internet entrepreneur, compulsive gamer, hoagie specialist, and former lonely homeschooled girl who overcame her isolated childhood to become the ruler of a new world… or at least semi-influential in the world of Internet Geeks and Goodreads book clubs. After growing up in the south where she was “homeschooled for hippie reasons”, Felicia moved to Hollywood to pursue her dream of becoming an actress and was immediately typecast as a crazy cat-lady secretary. But Felicia’s misadventures in Hollywood led her to produce her own web series, own her own production company, and become an Internet star. Felicia’s short-ish life and her rags-to-riches rise to Internet fame launched her career as one of the most influential creators in new media. Now, Felicia’s strange world is filled with thoughts on creativity, video games, and a dash of mild feminist activism—just like her memoir. ~Representation Matters: I have a lot of feels about this book. At first I thought, Felicia Day and I would have very little in common. I was never into World of Warcraft and I wasn’t really a big gamer (though I did have friends who were into it and I did know people who suffered from WoW addiction, it’s more common than people think). I wasn’t super involved in Star Trek when I was younger (though I am a big fan of Star Trek Voyager). But I love Books, I love anime and manga and I too have my own terrible collection of fan fiction. And it turns out, I do actually enjoy Role Playing Games like Dungeons and Dragons and Magic: The Gathering, all I needed was someone to explain it to me and people to play with. This is the kind of book I needed as a teenager dealing with depression, anxiety, self-harm and suicide idealisations because Felicia Day is a person who is unapologetically geeky and successful and those two things should be combined more often. ~Dysfunctional Family: I do enjoy the occasional reminder that my family isn’t the only one with problems, however I found the dysfunction of Felicia Day’s family to be surprisingly encouraging and inspirational, she repeatedly calls herself “that weird home-schooled kid” but I don’t find anything weird about her. While The Day family are all supportive of Felicia, her mother was very supportive and encouraging of her to try different and new things (the aforementioned geisha lessons), while encouraging her to enjoy the things Felicia did like (like acting, music and the internet), Felicia’s mother also taught her to stand up for what she felt was right and I think that those are all good things. ~Social Anxiety: As for the social anxiety that is mentioned so often but also triumphed over, those chapters were so painfully familiar, however (unlike myself) at least Felicia Day an excuse to fall back on. But the most remarkable thing is that Felicia Day doesn’t fall back on it, she struggles (of that there is no doubt), but not only does she persevere despite the obstacles, Felicia Day is also successful (sorry, lots of feels). Felicia Day had no experience of direction and no idea about making her own show but The Guild was made and so was Geek and Sundry. Felicia Day is a massive inspiration not just to Women or Gamers but to Creative Types in general. Overall, You’re Never Weird On The Internet (Almost) is a great book, it made me laugh, it made me cry but most of all it made me feel better about myself and maybe, just maybe, if I want something bad enough, it will happen, I just have to buckle down and turn off my inner critic :). I really REALLY want to read this because I loooved her as Charlie in Supernatural. Like one of my favourite characters EVER. And I’ve watched a few of her vlogs and omg she’s so funny! I hesitate only because I’ve never even done gaming. Bah, I don’t count sims. xD So I wondered if I might not relate at all?! But it doesn’t seem so from your review so OMG I JUST WANT TO READ IT 982980% MORE NOW.